"Tinkerbelle's real name was Jeri Lee Veronica Visser. She attended Rye High School, Rye, NY and graduated in 1963. She was brought up by her widowed father and a guardian named Grace. She was a devout Catholic and a poet, who put aside money every month to buy a set of 'wedding china' for her fairy tale future wedding to some unknown knight in shining armour. We used to sneak off to the Village whenever we could, by train. After we graduated we lived at the Hotel Earle, after which we got a shared apartment on West 14th Street and hung out in coffee houses on MacDougal Street like Feenjon, Reggio, Figaro, and when we had the money, Cafe Au Go Go to watch The Blues Project and Richie Havens. It was at Feenjon that we befriended Candy Cane (Darling), whom we both adored. One of the last times we saw Candy in the Village, she was already ill. She told us about the hormone injections and her wish to be perfect in front of the camera. She was already drop-dead gorgeous and we tried to talk her out of further treatments, but she was set upon being a Warhol superstar. That was the mid 1960s. 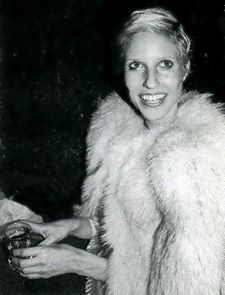 In addition to nightclubbing and writing for Interview during the 1970s, Tinkerbelle began appearing regularly on Anton Perich's cable television show in 1973 and soon became the weekly interviewer before going on to do a two-minute film criticism spot called "Tinkerbelle Goes to the Movies" for Newsweek Video - a TV broadcast division of Newsweek magazine. As a result of her success Newsweek began developing an idea for her own show, "Tinkerbelle's Parties." Producer John Peaslee recalls, "We were going to do a slicker version of Anton Perich. We shot dozen of parties. I felt like we went to every wonderful party in New York for two years."